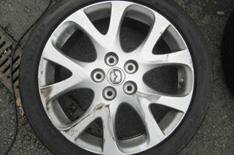 Our cars update: Mazda 6 wheels | What Car? I can take the sound of fingernails being dragged down a blackboard without any bother, but the sickening noise of an alloy wheel grinding into a kerb is just too much to bear. It's been many years since I last kerbed a wheel I still remember the poor Citroen C5 victim but now the Mazda 6 has suffered at almost every corner. They say bad things come in threes, and so it is with the 6 Estate's unfortunate alloys. To start with, I noticed the rear passenger wheel had been badly scraped by another driver too cowardly to admit their heinous crime. Next, I took a huge chunk out of the front passenger wheel while trying to squeeze between a car that was turning right and a particularly aggressive brick-work kerb that was going nowhere. Finally, I was side-swiped by a van driver performing an impressive modern-day version of Boadicea's bladed chariot-wheel attack. His 14-inch steel wheel buckled so violently in the onslaught that his tyre burst and peeled from the rim leaving me with an alloy that I feared would need to be binned. Not so, said mobile repairers Wheel Wizard (01675 471150) who ground, buffed, filled and polished all three wheels back to perfection in just a couple of hours. Their prices start at just 65 a wheel. Now the Mazda is pristine once again, I refuse to lend the car to anyone, drive three feet from every kerb and start to sweat at the sight of a Vauxhall Astravan.